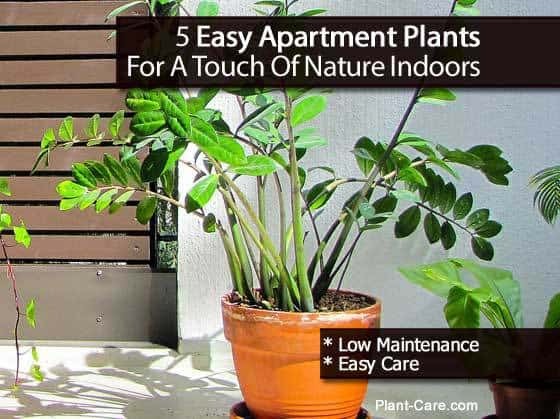 Living in an apartment or dorm can pose some interesting issues for those wanting houseplants to bring a little nature indoors. The space doesn’t allow for lots of big plants, plus with space being tight usually giving up the precious real estate is not at the top of the “must have” list – although having the easiest plants to take care of is! The limited amount of light available can also be a major consideration – using fluorescent grow lights to grow indoors may be a necessity. However, just having a few houseplants easy to care for offers a little “getaway” from the concrete jungle even with limited access to the outdoors. In our fast-paced society, who wants to take a lot of time caring for plants, we all want houseplants which are easy to care for with little time investment. We want plants that fit our wash and rinse lifestyle, we want to leave home for a week, and the plants will still be alive when we walk in the door. Peace lily – Spathiphyllum – Peace lily care is pretty easy and the plant handles lower light levels common to apartments. When Spathiphyllum gets is thirsty it tells you with drooping leaves. Spider plant care is pretty easy as well… their leaves droop when wanting a drink. Pothos or Philodendron – Most of the varieties grown for indoor use (Neon, Marble Queen, Jade, and Golden pothos), grow downward like an ivy. Lots of colors, although with lower light the colors will not be as vibrant, few pest problems and require limited quantities of water. ZZ Plant – The ZZ plant can survive in just about any setting. They are slow growers and have little demands for water and light, a very unique plant. Aglaonema – One of my favorite groups of plants. Lots of color choices, many new Aglaonemas handle cold much better and tough! Aspidistra – Also know as the tough cast iron plant. This tough as nails houseplant was a favorite in Victorian times along with the Kentia palm. Back then houses were anything but bright and airy – much like apartments! In the Southern United States, you can find Aspidistra growing completely carefree as a groundcover in dense, dark shade. One note – The Peace lily, Pothos or Philodendron, ZZ plant and the Aglaonema all come from the Araceae family. Sorry that was six, not five choices in our picks for – best plants for an apartment. Now that you know which plants to look for – go get’em!